The first new recipe for August is courtesy of Natashia Bevilacqua at Food on Paper, all the way from Australia! 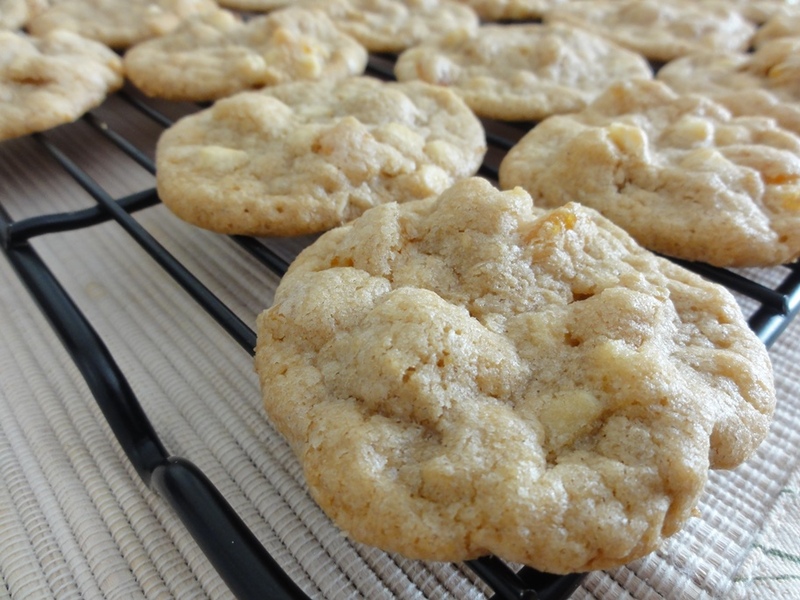 I originally found this recipe back in May when I was looking for something to do with apricots and white chocolate, which lead me to the White Chocolate Apricot Oatmeal Cookies. 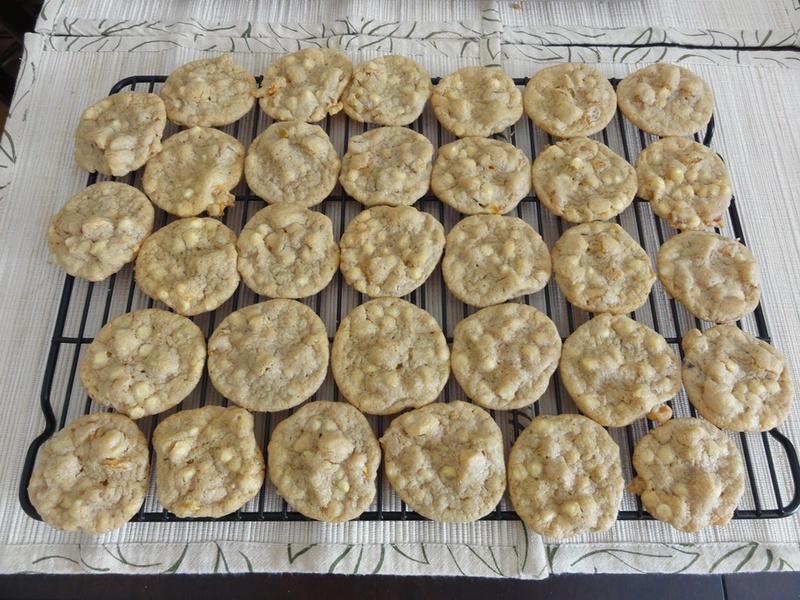 Natashia’s Apricot, White Chocolate and Macadamia Cookies have been on my to-bake list ever since, and I’m glad that I finally got around to making them! 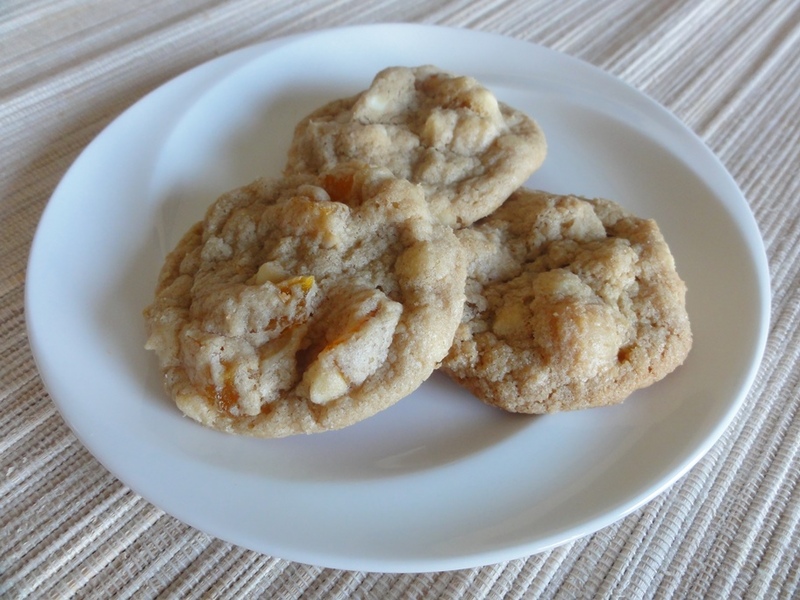 The combination of white chocolate and apricots seems to me to go well with summer, perhaps for the lighter flavors, and white chocolate and macadamia nuts are always a great combination making these cookies overwhelmingly tasty and summery. Speaking from close, personal experience, it’s very hard to stop eating them. The good news, if you don’t mind that last point, or bad news if you do, is that this recipe makes a lot of cookies. You’ll want to have some people ready and willing to accept boxes of cookies when you make these and afterwards you’ll have some very happy people. I made a few modifications to the original recipe; experimenting a little based on past experiences. First up I toasted the macadamia nuts, which is par for the course for me with nuts in baking. 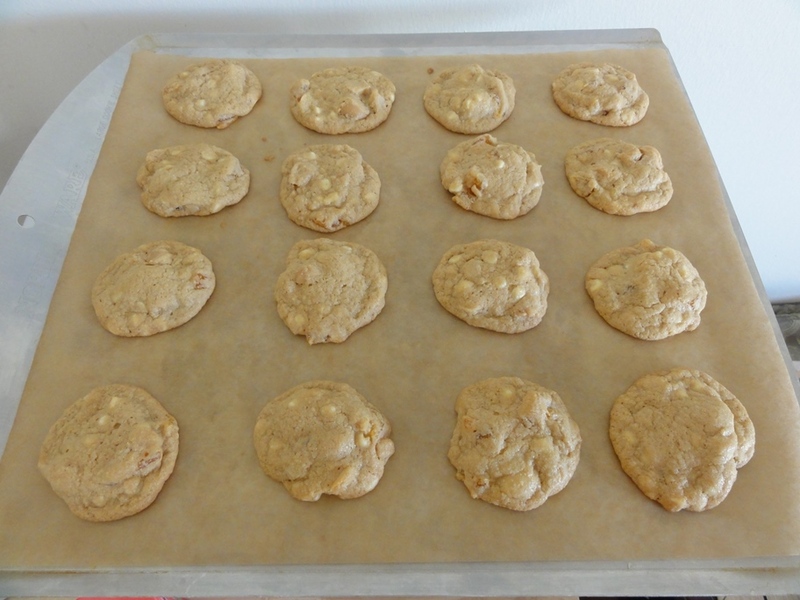 In thinking back to the Salted Caramel Chocolate Chip Cookies and how I thought the quantity of caramel chips should have matched the chocolate chips, I doubled the quantity of chopped apricots in the original recipe in order to bring them up to the same quantity as the macadamia nuts and white chocolate. Given how often I can taste the apricots alongside the other two flavors I’m happy with that decision. I also upped the flour a little and chilled the dough for 30 minutes in the fridge to help keep the cookies from spreading out too much. 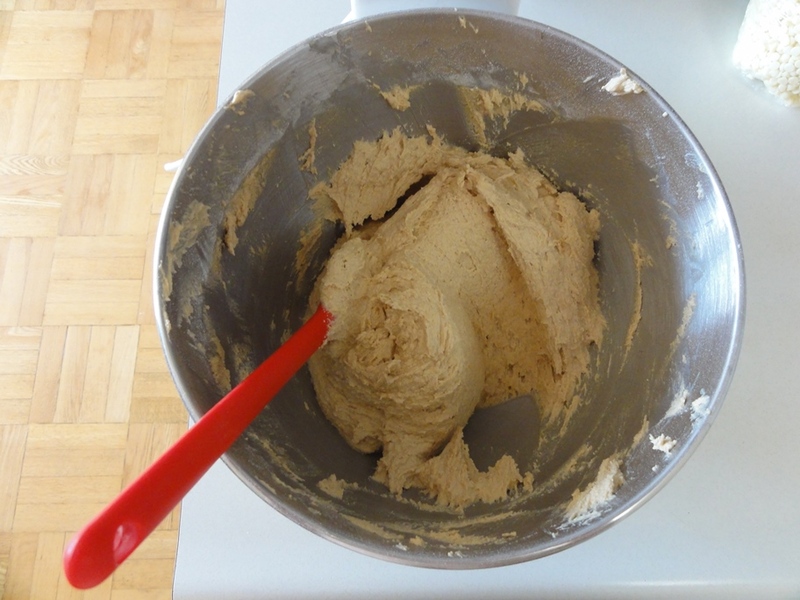 The picture above is from the first batch (or rather, less than half of the first batch) when I used with the original recipe’s quantity of flour and didn’t chill the dough while the final picture at the end is from the second batch with both modifications. Finally, judging the quantity based on previous recipes, I added 2 teaspoons of cornstarch to the second batch and I think it made a positive difference in the soft-and-chewiness department. Preparation Time: 20-30 minutes, plus 30 minutes in the fridge. 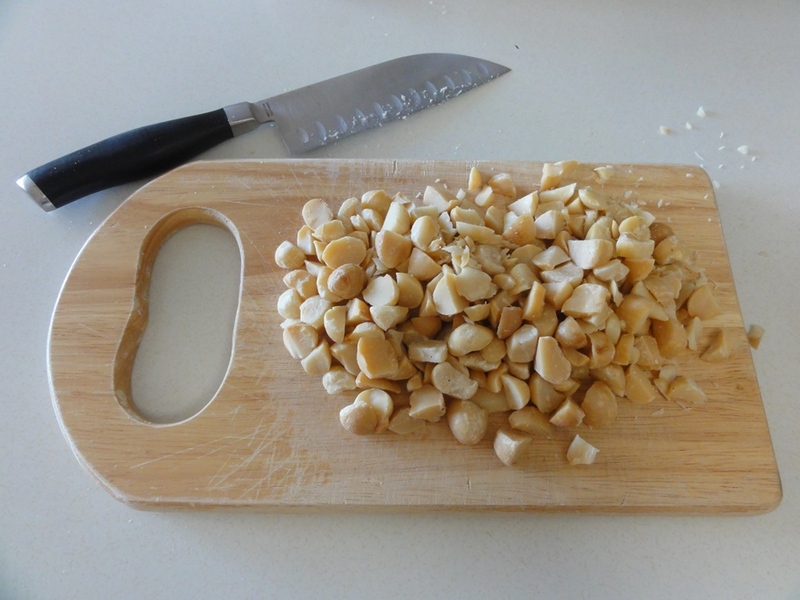 Spread the macadamia nuts on a lined baking sheet and toast them in the oven for 5-7 minutes. Cream the butter and sugars together on low speed for about minute, and then on medium speed until light and fluffy; about 3 minutes. 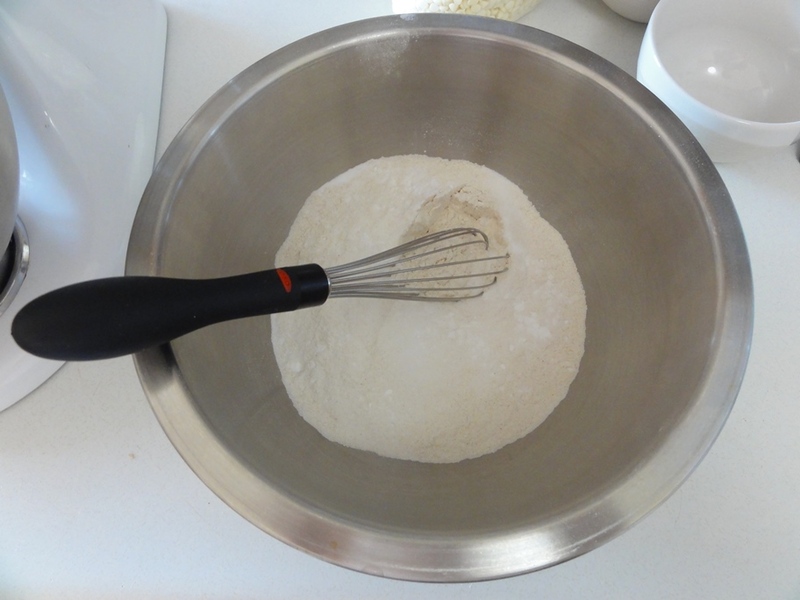 In a medium bowl, whisk together the flour, cornstarch, salt, and baking soda. Slowly add the dry ingredients to the wet while blending on low speed, at most a quarter of the dry between blending until well combined. 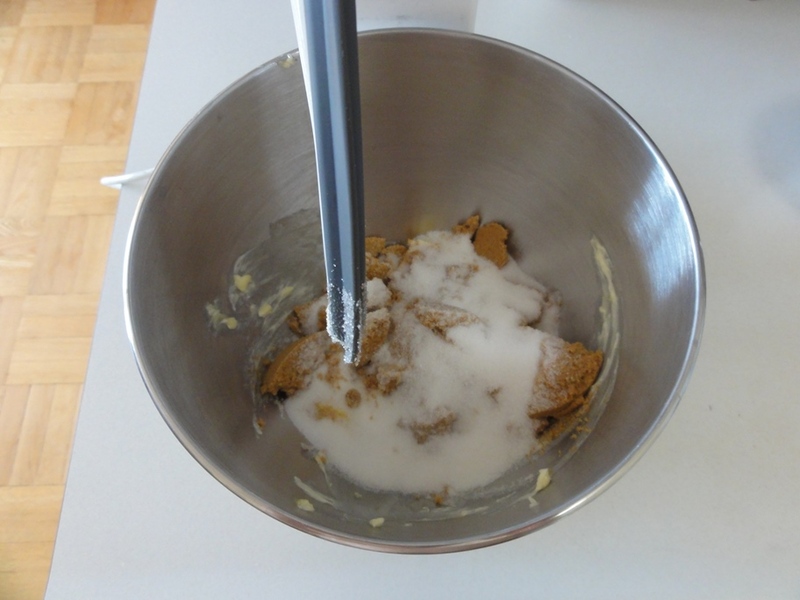 Blend together until no more dry ingredients are visible. 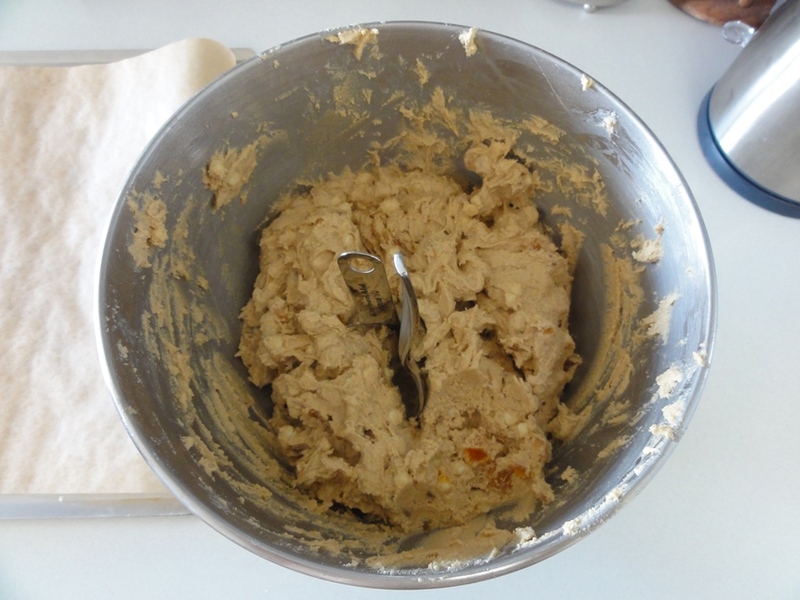 Fold in the macadamia nuts, chocolate chips, and dried apricots. Drop level tablespoonfuls of dough onto lined baking sheets. Bake the cookies for 10-12 minutes, or until the edges are golden brown. Let the cookies cool on the sheets for 5-6 minutes and then transfer them to racks to cool completely. For those of you keeping score, when I said above that I made a second batch to test out the modifications of more flour and 30 minutes of chilling time, yes that means I made an absurd amount of cookies. Fortunately, for the sake of my health, most of them are going out the door to be foisted upon other people. 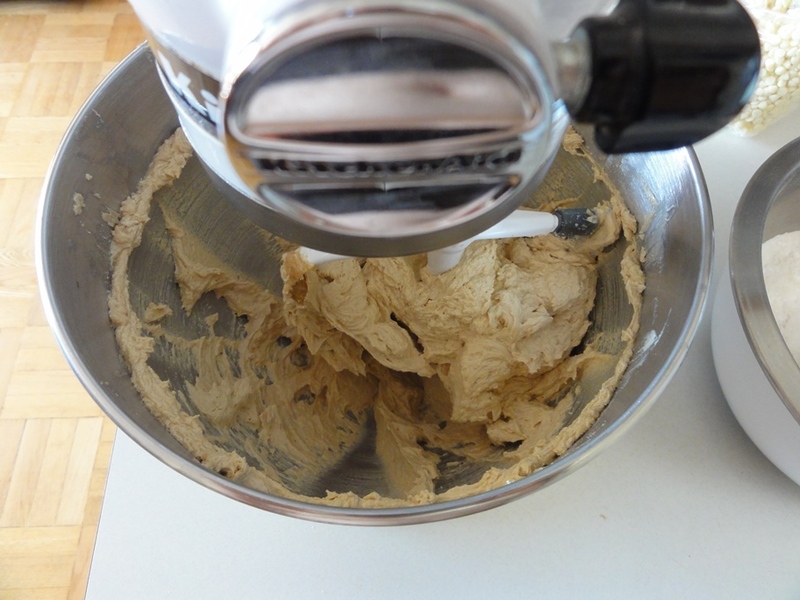 That being said I did not quite make 160 cookies because I froze about 2/5ths of the dough from the second batch; I’m curious to experiment once again with frozen cookie dough. Stay tuned for a few weeks from now to see what happens when this dough is thawed and baked. The one problem I have with the 30 minute chilling phase is that it means running up the oven just to toast the macadamia nuts, which is not the most energy-conscious use of one’s oven. If you’re fortunate enough to have room in your kitchen for a toaster oven you might want to consider toasting them in there instead. 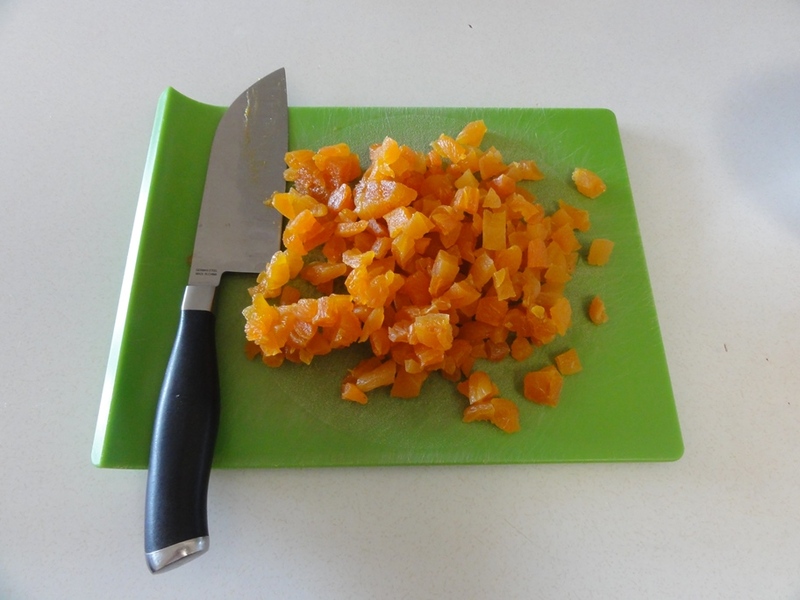 For reference, this is what a cup of chopped apricots amounts to. 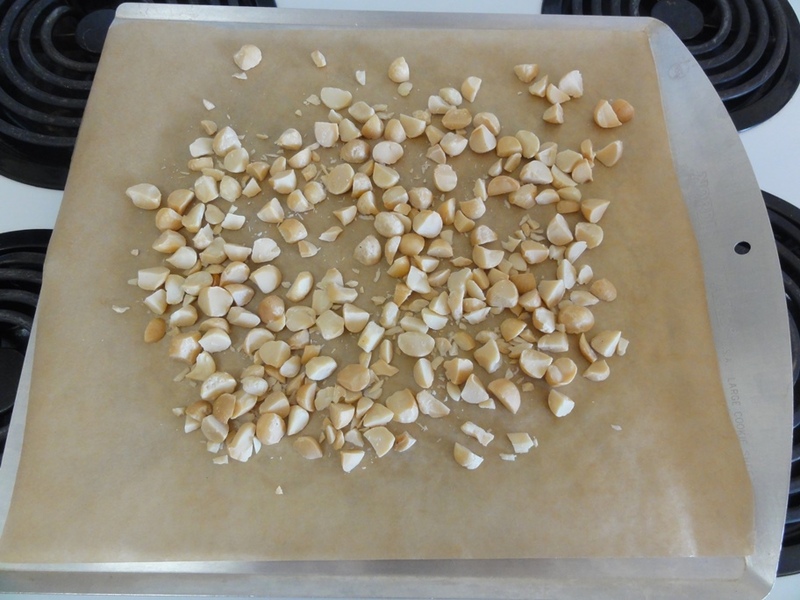 The same quantity of macadamia nuts, untoasted and then toasted! Now we can cream the butter and sugar together. 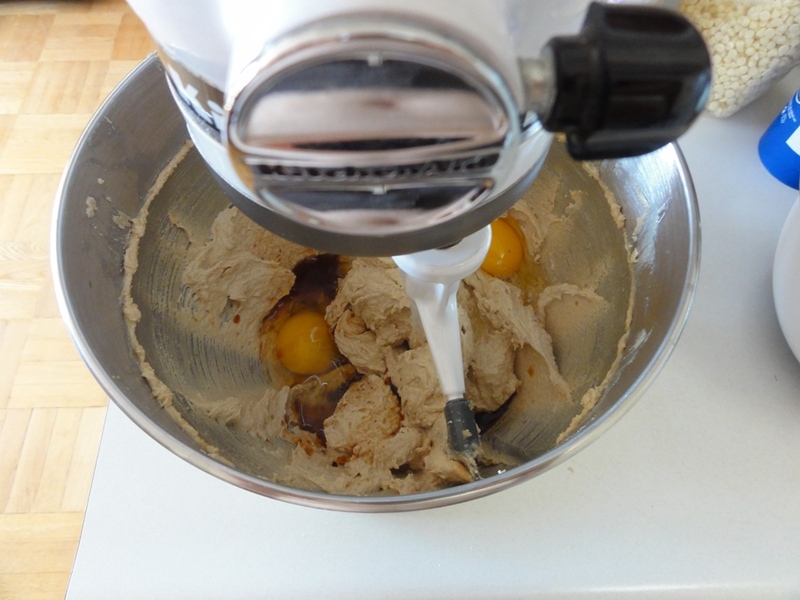 Add in the eggs and vanilla and keep beating until you reach a consistent color and texture. 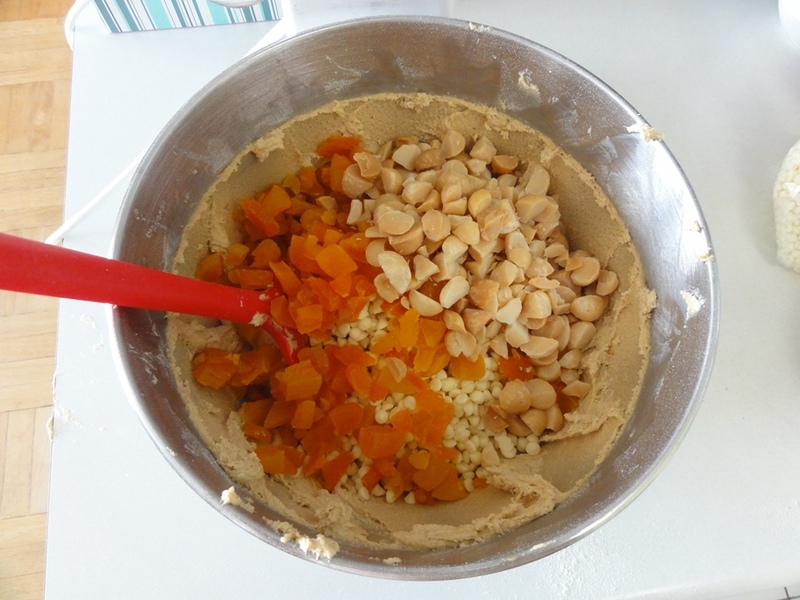 Mix together your dry ingredients separately to ensure the small quantities are evenly distributed. 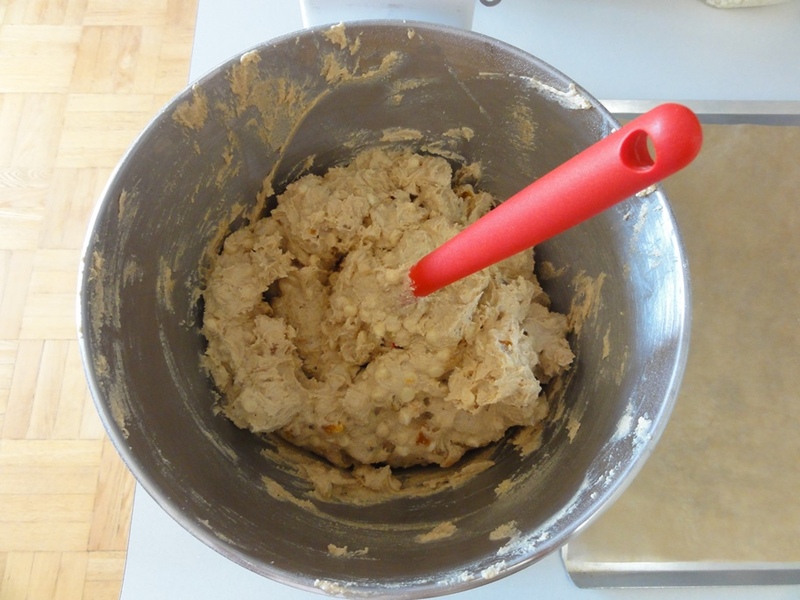 The dough without the bits should still be fairly easy to work with. Now add your three cups of summer flavor. Not all of mine made it into the bowl; it was just too easy to nibble! After 30 minutes in the fridge the dough should be a little firmer than it was before but still easy to work with. I gave the cookies room to spread and room for the heat to distribute evenly around them; 16 per sheet is my new standard unless I happen to already know that the cookies will mostly hold their shape. 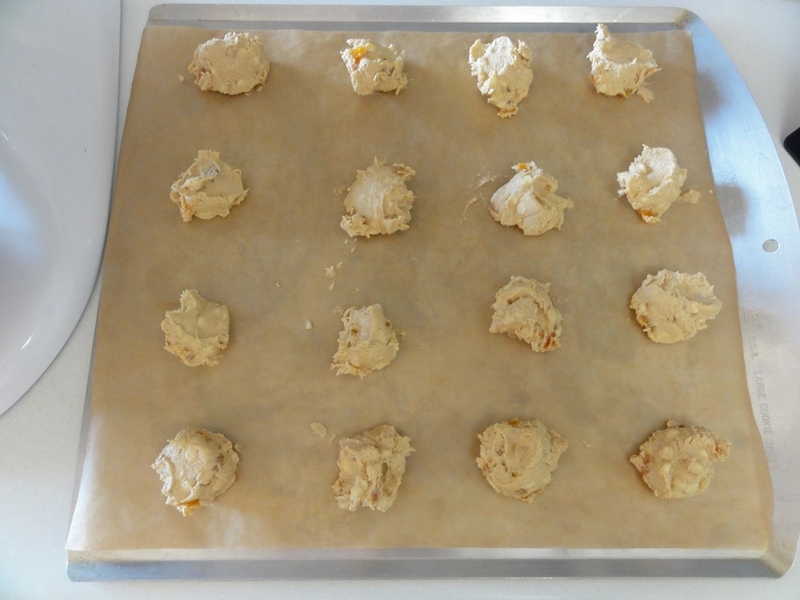 This photo is from the second batch of cookies a few minutes after they came out of the oven; they held up to a more 3-dimensional shape than the first batch. Finally, some of the cookies that I kept for myself. Remember folks, sharing is caring, but eating cookies brings personal happiness so be sure to compromise on how many of these you give away rather than keep for yourself!